As any doll collector, or holiday gift shopper, can tell you, the majority of dolls are female. There are little boy dolls to be found, to be sure; but they are fewer and farther between than girl dolls. This is no accident. Nor is is some gender-stereotyping conspiracy on the part of toy and doll companies. (After all, they are in the business of making money and would likely relish the opportunity to sell more dolls to more boys!) From baby dolls to fashion dolls, female dolls just sell better. And that is due in no small part to the fact that the majority of those buying, playing with, and collecting dolls are female themselves. Science seems to show that girls play with dolls because they’re programmed to, that this biological predilection is likely hardwired into our DNA. Along with studies with chimps, there is a long human history to turn to as well. In 1929, Marjorie MacDill wrote an article entitled Ancient Dolls and Toys Tell Whole History of Race, in which she consulted with Dr. Karl Groeber of Dresden, Germany, a man who studied the history of toys, specifically as they portray the minds of children throughout the ages. According to Groeber, "[F]rom prehistoric times down to the present, a little girl's play interests always have kept to one orbit. Her mother's round of household duties is the model for her play until the end of childhood. Her doll's dress may reflect the change of time in crinoline, stiff brocade or Scotch kilts. Her doll's house may have four-post beds or old-time cradles, but the idea underlying the little girl's paraphernalia of playthings remains the same." In other words, the play of little girls readies them for their grown-up roles in the world. And female dolls reflecting their own images, present and future.. Along with building maternal and nurturing skills, dolls have been used as learning aids in other ways. Dollhouses, for example, teach girls about running a household. Anatomically correct dolls have been used for centuries to educate doctors, nurses, and other health professionals, as well as to assist in communication with children and other patients. All of this seems to make sense when it comes to baby dolls, miniatures, and lifelike dolls; but what about fashion dolls? Fashion dolls do more than just display the fashion trends of the era (or a past era). 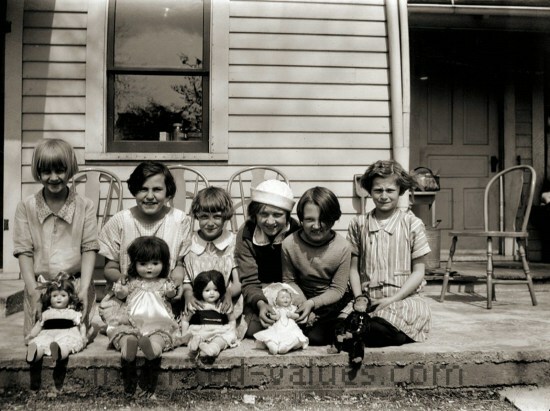 Years ago, fashion dolls also taught sewing, knitting, and other needlework skills. For even if a young girl couldn't actually design fashions, she could learn how to follow a pattern and learn a skill set that would serve herself and her future family. She might even find she’s prepared herself for a career as a seamstress. In today's world, however, there is less emphasis on the creation of fashions for fashion dolls. At least at the general consumer level. As many doll collectors well know, there is a whole world of self-made, custom, and even one of a kind (OOAK) dolls and fashions that one can get into, either by trying their own hand or by testing their own wallet. But even if fashion design and sewing skills seem to be lacking in today’s fashion doll world, there are things girls can learn from fashion dolls. In the dressing, accessorizing, styling of the hair, and, in some cases, application of makeup, fashion dolls teach styling and grooming skills. These skills matter in women's lives -- no matter how some may wish to deny or diminish it. At a simple level, it’s as important to know what to wear to the beach as it is to know what is appropriate to wear (or not to wear) to the office. On a more complex level, a girl has the opportunity to mentally try on the career once her doll wears the related costume. And of course, there’s always room for dreamy fantasy play too. As for why adults return to dolls, there are many reasons for us to once again pick up our childish things. Nostalgia, is one of the largest reasons. Whether we are returning to our old friends, or getting the friends we wished we’d had when we were young, we like to revisit our childhood in healthy ways. Some with children grown and gone from our homes find dolls a great place to invest our still-here maternal and nurturing instincts. A few of us return to dolls to tackle skills, like sewing, that we didn’t have the chance to master before. Many of us admire and collect the artistry and craftsmanship of skilled doll makers; dolls are the art we wish to surround ourselves with. And, like art collectors, more than a few doll collectors hope they are investing in pieces that will continue to be valued in the future. Some of us are drawn to pieces from a past that is nowhere near our own. Others find themselves collecting today’s creations to stay connected to younger generations. And some of us do both. For it is through dolls that we feel connected to those who’ve come and gone before us and those who will be here after us.